Orficast is the new generation of thermoplastic materials for immobilization purposes. 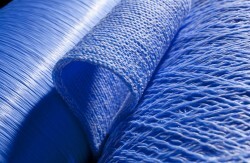 It is a stretchable, self-adhesive textile, knitted from thermoplastic fibers. The blue version has been around for a while, and now we also offer Orficast in an appealing black colour. Although it looks simple, Orficast is high tech! Orficast makes it easier to address your splinting and casting challenges in a way that will surprise you! 1) The low activation temperature (65°C -149°F) allows you to apply the Orficast directly onto your patient without burning the skin. 2) Orficast conforms perfectly to the patient’s individual anatomy. 3) The activation time is really quick! (Maximum 1 minute in a Suspan water bath). There is just enough working time to wrap the material on the patient. Within 1 minute, the cast is already hard enough to support the injured body part. 4) The knitted structure results in a stretchable, thin, lightweight splint or cast which allows the skin to breath and prevents maceration. 5) There is no need to wear gloves while using and applying Orficast. 6) Heat activated Orficast is self-adhesive: the overlapping layers will stick to each other when firmly pressed together. 7) The fabricated Orficast splint can easily be trimmed with scissors to remove excessive material. 8) The resulting splint is light and compact, allowing patients the ability to continue their daily tasks without interference. 9) Orficast has a comfortable and soft feeling: the edges of the overlapping layers are visible on the outside of the splint/ cast but are not felt on the inside. 10) Orficast can be reactivated in order to completely remake the splint or make small corrections to the shape. – Activating the Orficast tape with dry heat allows for the making of larger and multi-layered splints for the wrist and ankle. Orficast is available on rolls of 300cm in 2 sizes: 1-1/5″ (3cm) wide for finger applications or 2-1/4″ (6cm) wide for thumb/hand applications. More information about Orficast Thermoplastic Material can be found on our website. Are you interested in trying Orficast? Contact one of our Product Specialists: Björn (Bjorn.leRoy@orfit.com) at our headquarters or Debby (debby.schwartz@orfit.com) at Orfit® Industries America to receive a trial sample. Our world-wide list of distributors can be found here.